It felt like a quasi-religious meeting. 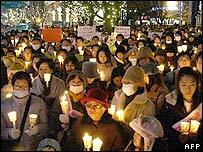 A thousand people gathered for a candlelit vigil on an icy night in central Seoul - a show of solidarity with the cloning scientist that they still call the "pride of Korea". 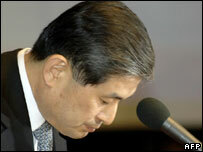 Dr Hwang Woo-suk had been exposed as a fraud by his colleagues at Seoul National University. His two landmark papers on cloned embryonic stem cells were found to have been fabricated. But Dr Hwang can still count on a hard-core of supporters and many more who are reluctant to accept the downfall of a national icon. "Faking the research paper was not so important," said Lee Young-sil, who came home from Japan to show her faith in the scientist. "The important thing is that he made important progress in his research. Bringing down a scholar like this is not helping the country." Dr Hwang's cult-like following was fuelled by nationalism, and has proved remarkably resilient despite evidence that he fabricated research and then lied about it. The government also played a key role in the scientist's rise to glory - seeing political advantage in promoting him as the face of the future. He was held up as a harbinger of a high-tech future for a country nervous about competition from China in traditional manufacturing. "Government policies to support and finance Hwang's work merged with nationalism and patriotism to create a quasi-fascist environment that suppressed criticism," said political scientist Choi Jang-jip. Hwang Woo-suk is still fighting to redeem his reputation with a once adoring public. After weeks in seclusion, he apologised for the fabrications in his papers but claimed he had been duped by fellow researchers. He continues to insist he does have the core technology to clone human embryos and he appealed to patriotic sentiment to be given a second chance to prove it. But even as he spoke, his status as national champion and scientific superstar was rapidly deflating. The government stripped him of his unique title of Supreme Scientist; stamps featuring the celebrated cloner were quietly withdrawn; and school text books extolling his virtues are being revised. Biographies of the 53-year-old veterinarian were also disappearing from Seoul bookshops - there were 16 at last count, including children's comics and hagiographies portraying the scientist as a role model for Korean children. Hwang Woo-suk's motives have baffled colleagues and scientists around the world. 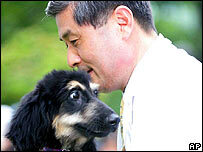 He was an acknowledged leader in his field of animal cloning. The Afghan hound "Snuppy" has been verified as the world's first cloned dog. In his public statements, Dr Hwang says he was driven by ambition and national pride. "We became crazy for our work and were blind to everything else. The only thing that I could see was the hope South Korea could stand high at the top of the world," he said in his latest encounter with the media. The truth remains obscured by conflicting claims and allegations. Junior researchers say they were ordered to fabricate results. Dr Hwang insists they deceived him and he has called on prosecutors to investigate his allegation that stem cell lines were switched. Increasingly, the government's role in the scandal is coming under the spotlight. The government identified the biotechnical field as an industry of the future and poured in investment and support, said Lee Jae-myung of the liberal pressure group People's Solidarity for Participatory Democracy. "The government bragged about Dr Hwang's results as if they were its own, but they failed to check the validity of any of the supposed achievements. The government has to take responsibility for this." Ministries offered their full support to Dr Hwang's team at Seoul National University when allegations of wrongdoing first surfaced. A wave of nationalist emotion initially helped to silence those raising questions. Now, even in top government circles, some are still prepared to speak out for the disgraced scientist. "Dr Hwang asked for forgiveness, so people should be more generous and give him an opportunity to rise again," said Chung Dong-young, a recent cabinet member and now a leading presidential contender from the ruling party. Dr Hwang's fall from grace has stunned scientists around the world, who thought he had made a revolutionary breakthrough. The shock and bafflement in his own country is even more acute; but even now some Koreans are reluctant to accept their hero was a fraud.